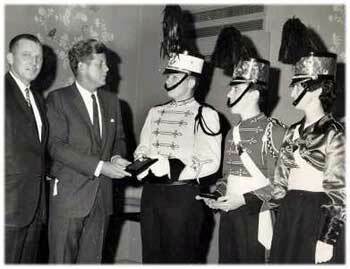 Matt Colo, a Boston Crusaders trumpet player, submitted this photo of former U.S. President John F. Kennedy becoming an honorary Boston Crusader. Another honorary Boston Crusader of note: DCI executive director Dan Acheson. This picture is one of those items that really doesn't fit into any neat category (kind of like the "Bob Hope meets the Anaheim Kingsman" photo we ran a while back), but it's cool anyway.